Here are 30 funny tiger jokes by Boys’ Life readers that will make you howl with laughter. Do you know a funny tiger joke? Q: Why did the tiger loose at poker? Q: Why can&apos;t a tiger become a herbivore? A: A tiger can&apos;t change his stripes. Q: What&apos;s striped and goes round and round? Q: What&apos;s the silliest name you can give a tiger? Q: If a four-legged animal a quadruped and a two-legged animal is a biped, what&apos;s a tiger? 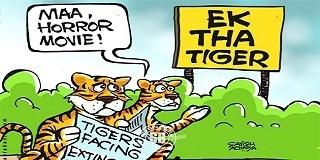 Q: What happened when the tiger ate the comedian? Q: What does the tiger say to his friends before they go out hunting for food? Q: What do you get if you cross a tiger with a watchdog? Q: What is tiger&apos;s favorite food? Q: How does a tiger greet the other animals in the field? Q: On which day do tiger eat people? Q: Why don&apos;t tigers like fast food? Q: How do you take a tiger&apos;s temperature? Whomever it was tiger jokes, first, we’re sure glad he did. Here are our favorite "funny tiger jokes". Feel free to add yours to the list in the “Comments” section!